Source of Earliest Record: Shiwu Bencao. Part Used & Method for Pharmaceutical Preparations: The flowers or flower buds are gathered between April and June, then baked before using. Properties & Taste: Sweet, slightly bitter and warm. 1. Qi stagnation in the liver and stomach manifested as costal pain, epigastric distension and stomach pain. Rose (Meiguihua) is used with Finger citron (Foshou), Curcuma root (Yujin) and Cyperus tuber (Xiangfu). 2. Blood stasis and pain caused by external injuries. 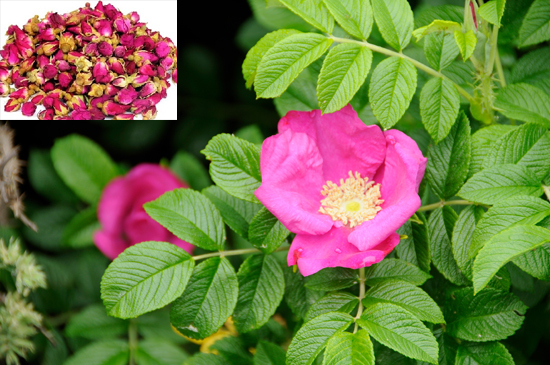 Rose (Meiguihua) is used with Chinese angelica root (Danggui), Corydalis tuber (Yanhusuo) and Red peony (Chishao). 3. Qi stagnation in the liver and blood manifested as irregular menstruation and distension and pain in the breasts before the menstruation period. Rose (Meiguihua) is used with Chinese angelica root (Danggui), Chuanxiong rhizome (Chuanxiong), White peony root (Baishao) and Bugleweed (Zelan).